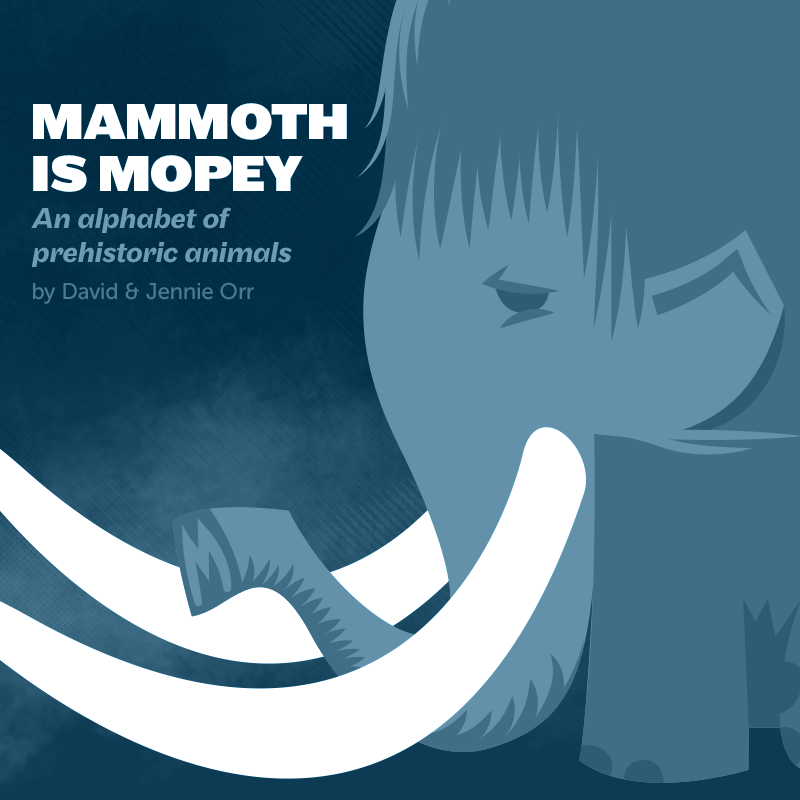 Prehistoric Beast of the Week: Let's Publish Mammoth is Mopey! As someone who has experience in the field of education as both a formal and informal teacher at schools, museums, and zoos, I know as well as anyone how important learning is, especially when it comes to science. What many folks fail to grasp, however, is that you will never get anywhere with any learner (regardless of age) unless they are having fun or are in someway invested. It's true. This brings me to a book written and illustrated by David Orr from over at Love in the Times of Chamsosaurs, titled Mammoth is Mopey. This books looks to be everything I could ever want in a kid's book. In fact, it hits young readers with education on three fronts all at the same time. 1) It teaches them letters and reading, which is paramount for different development stages. Each page features a prehistoric animal with a name starting with a different letter of the alphabet. This is good for the very young ones. (3-5 years) As years go by the book retains its value because it also teaches reading skills. Ever wonder how to pronounce Estemmenosuchus or Jeholopterus? Wonder no more with this book because there is a pronunciation key with the names so young readers (and adults in the case of some of the names) can sound them out together. Just a typical yodeling Yinlong. 2) This book teaches them vocabulary! Each page of the book features a prehistoric animal and an adjective that starts with the same first letter. 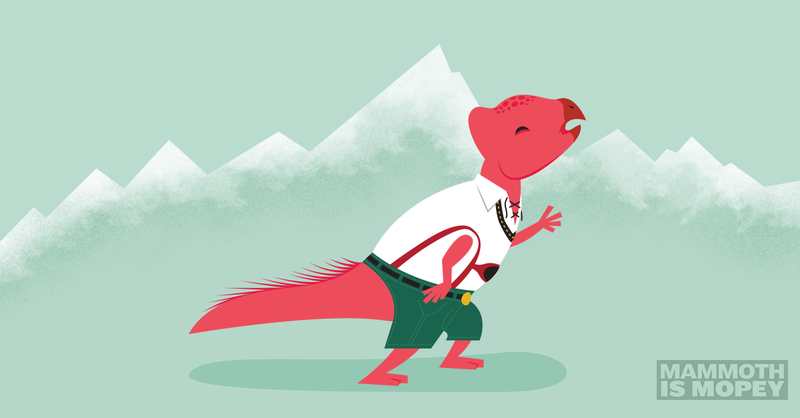 Find out what "dapper" means and why it has to do with Dinofelis rocking a bow tie and top hat. 3) It teaches them science! Far too often I hear people challenge funding for paleontology, stating "it doesn't do any real good for society and the money is better spent someplace else." Aside from the fact that this statement is so wrong on a few levels, at the very least, paleontology is a perfect gateway to get kids at the youngest of ages interested in science without even knowing it. Is every child who was ever obsessed with dinosaurs going to grow up to be a paleontologist? Perhaps not, but they might turn into doctors, or engineers, or geologists... Loving one field of science opens doors and minds into other fields if that love persists. The earlier this takes place the better. Mammoth is Mopey, makes a point to introduce not just the typical popular creatures, but also some of the lesser-known, more unusual species, that may not always get the limelight they deserve. In addition to this, each page gives some information about the animal itself for young readers. 4) It's fun. Like I said, the best way to educate is to wrap it all up with a nice flashy package of fun with a pretty bow of humor on top. Kids will love reading this book and/or having this book read to them. 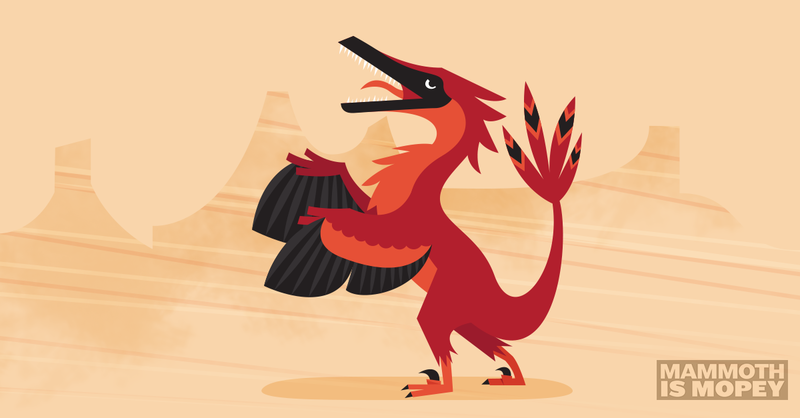 More realistic Velociraptor than most of the stuff that gets fed to kids with the "scientific accuracy" label slapped on it nowadays. So how do you get this book? Well, it isn't published yet, but it will be soon and you can help the process along! David and his wife, Jennie, are looking to self publish this book through a site which allows anyone to contribute donations to help them reach their goal. Depending on how much you contribute, you will get extra stuff like signed copies of the book, buttons, signed prints of the illustrations to hang on your wall, or even a custom illustration Dave can do of any animal of your choice! Follow this link to get involved!